I want to say something upfront here … I actually believe measuring teacher performance is critical to the process of developing quality learning and teaching. However, I think that virtually every government driven approach that uses student value-added data as the key measure is flawed and will drive teacher behaviour that will destroy the great things about education and learning. I know that I am supported by many others in the opinion about the destructive nature of the current teacher evaluation approaches. So rather than pointing out why this system is destructive without pointing out a possible solution, let us look to where else we could find possible approaches to measuring a teacher’s performance inside the team environment that student learning occurs. The most highly measured teams in the world occur in sport. Whether the player plays American Football, Soccer, Australian Rules Football, Baseball, etc. a wide range of statistics are gathered. In EVERY SINGLE high performance sporting team in the world, who all have an enormous commitment and reliance on performance, one does not measure the value and performance of individual players in a team sport by the touchdowns or goals scored. You measure the value or performance of a player by their ability to perform their role – normally measured by a range of key performance indicators. The game is won by the cumulative effect and effort of the individuals delivering on their roles within the game (including dealing with the counter-strategies and plays of the opposing team). Now drawing a link to schools and learning. The game being played is the student demonstrating the skills and understanding required by the educational system for that year level. In the case of schools the measure of success, in many teacher performance approaches, is the value-adding to students of their ability to perform on a single test on a particular day in a particular year. To win that game the team in the school must perform in their role - so that is what we must measure. So what could we measure that would give a reasonable indication of the ability of a teacher to perform in their role? A team’s victory is the accumulation of actions that leads to a winning score – the winning score itself is a secondary effect of those actions. In the same way the student performance is a secondary effect of the school team’s accumulated actions. The measures would have to be based on what the teachers are directly responsible and accountable for. So what are they directly accountable for that would lead to a reasonable set of measures? I have been inquiring into this with a working party of teachers as I support them in developing a teacher performance framework for their school. We ended up with similar thoughts to teacher performance that Bill Gates (shock horror) discussed in a recent article. After several months of work this is what we ended up with … and it makes complete sense. Their capacity to build a professional working culture defined by aspects such as being in positive staff relationships, being a team member, being professional, and being self-reflective. Their capacity to build positive relationships with students and parents defined by aspects such as role modelling, praise and encouragement, creating a safe environment, communication, encouraging risk-taking in learning, etc. Their capacity to deliver the curriculum through appropriate pedagogical practices defined by aspects such as curriculum documentation, unit planning, evidence-based powerful learning practices, etc. This can be represented by the following Venn diagram. The Venn diagram indicates that the best performance comes from the conjunction of all 3 elements. A Teacher can have some performance by being strong in one or two of the framework areas but the greatest performance will occur when all 3 are present. If a teacher is challenged in their personal capacity to be a team member, be professional, self-reflect … then of course it would affect their ability to build relationships with students and do their job. If a teacher is challenged in their capacity to role model and build relationships with students and parents, then it again would impact performance and delivery of curriculum. If a teacher is challenged in their ability to apply evidence-based pedagogy, plan authentic learning units, have quality educational learning rituals in classes, this would also affect performance. What we have done as a working party (which includes teachers, heads of departments, senior management within the school) is to create three formative rubrics that are designed to describe explicitly what the behaviour of teachers would be on key focus areas within these 3 domains. We are currently identifying a scaffold of structures, habits, and processes that would support the development of teacher performance along the spectrum we have defined. 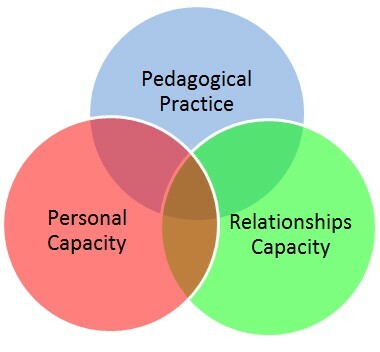 In my next blog I will go into the formative rubrics we have designed to support teacher development in these 3 key areas and how we are intending to use these both support building teacher capacity and measure their performance. When you see the rubrics you will be quite surprised about how empowering they can be for teachers. Please feel free to comment on this blog. If you are interested in finding out more about our work please email me at adrian@intuyuconsulting.com.au.